The property offers WiFi in public areas, bar, restaurant, garden and parking. Each apartments has fridge, air conditining (extra charge), safety box (extra charge), bathroom with bathtub or shower, WC and veranda or balcony. * Important! Check-in & check-out, reception, swimming pool with a separate section for children,restaurant and snack bar are at the Amazones Village Suites, located 5 min. walking distance away. * *Arrivals outside reception opening hours will find a note at the reception in order to receive the key. While booking this hotel you are requested to send your flight number and arrival time. * ** Please note that some of the above facilities may be closed due to weather, seasonal conditions. ** Address: Koutouloufari, Hersonissos, 70015 Crete, Greece. 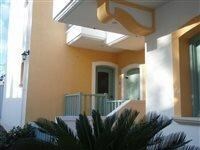 Located in Hersonissos Centre, this guesthouse is within a 15-minute walk of Aquaworld Aquarium and Aquaworld Aquarium. Sarakino and St. Paraskevi Church are also within 1 mi (2 km).